That combination is best showcased in Ellis’ eccentric combo Double-Wide, which recently released its third album, Charm, on Ellis’ own Parade Light Records. While the title is an apt descriptor of the band’s inviting, joyous vibe, its soul is even better captured by the song that gives the album its name: “Charm is Nearly Always Sinister.” That dichotomy perfectly encapsulates Double-Wide’s split metropolitan personality, with a chainsaw-juggling balance of bayou brass, raucous gospel, and devil-may-care modern jazz. Ellis’ band of merry pranksters includes Gary Versace (organ/piano/accordion), Alan Ferber (trombone), Matt Perrine (sousaphone), and Jason Marsalis (drums). Ellis also leads his own quintet of A-list players, whose most recent album was the 2012 Criss Cross release It’s You I Like. Featuring Mike Moreno (guitar), Aaron Goldberg (piano), Matt Penman (bass), and Rodney Green (drums), the album definitely leans more toward the NYC end of Ellis’ playing spectrum, though its two dedicatees still show off his “serious fun” duality: the repertoire includes songs by moody singer-songwriter Elliott Smith and legendary kids’ TV host Mr. Rogers. As if those three wide-ranging projects weren’t enough to occupy his time and talents, Ellis also maintains an impossibly busy schedule as a first-call sideman. 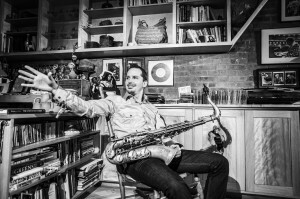 Having established himself as one of New York’s premier tenor saxophonists since his arrival in 1997, he’s since worked with artists as diverse as bass great John Patitucci, organ legend Dr. Lonnie Smith, MacArthur Fellow Miguel Zenón, the Brooklyn-bred big band led by composer Darcy James Argue, guitar groove master Charlie Hunter, and pop icon Sting. His discography lists more than 100 album credits as a sideman, with more than a dozen released in 2014 alone, including acclaimed albums by Zenón, drummer Otis Brown III, pianists Helen Sung and Edward Simon, and blues/gospel/soul trio The Holmes Brothers. While New Orleans and New York are Ellis’ two spiritual (and, over the last 22 years, actual) homes, he doesn’t hail from either city – or any city at all, for that matter. He grew up in rural North Carolina, two and a half miles outside of a tiny town populated by only 200 people. But his mother, an English teacher at the local community college, insisted that her sons be exposed to culture, and the love of music took hold in young John, who pursued that love to the University of North Carolina School of the Arts in the relatively big city of Winston-Salem. In 1993, Ellis moved to New Orleans to study with renowned jazz family patriarch Ellis Marsalis, eventually playing in the pianist’s band while jamming with local peers like trumpeter Nicholas Payton. He released his debut album, The Language of Love, in 1996 and a year later relocated to New York City. Despite the move, the name of his 2005 album One Foot in the Swamp captures his continuing ties to the Bayou, which shines through in the southern-accented, gospel-tinged funk grooves of his music. Ellis has released nine albums as a leader, three of those featuring his urban carnival band Double-Wide, which has toured extensively and was featured on the Main Stage of the 2012 Newport Jazz Festival. While his presence on countless recordings and stages attests to the esteem in which Ellis is held by his peers, he’s also received numerous more official accolades. Most prominently, he was the second place winner of the prestigious Thelonious Monk International Saxophone Competition in 2002. He was the recipient of three composition grants through The Jazz Gallery for his collaborations with playwright Andy Bragen (“Dreamscapes”, “The Ice Siren”, and “MOBRO”) and was selected as the 2014 Make Jazz Fellow by the 18th Street Arts Center in Santa Monica, leading to the composition of music for Charm.